Is Image Alt Data Really Important for SEO? When it comes to search engine optimization, there are several elements that should – no, NEED to – be optimized. Most people with a general knowledge of SEO know that the on-page content should include keywords you’d like the page to show for in the search results. 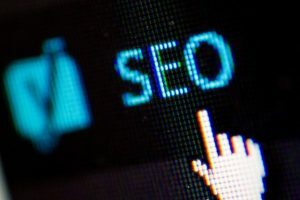 With a little deeper understanding of SEO, you learn that title tags are among the first places the search engines look for information about the page and that each page needs its own unique, keyword-rich meta description – for the benefit of the search engines and for searchers. But an element that many overlook or underestimate is the image alt data. Is image alt data really important for SEO? If your images are properly optimized with titles and/or alt data that includes relevant keywords, they will be more likely to show up in an image search for those terms. This has the potential to increase the visibility of, and the amount of traffic to, your website. In turn, it has the potential to generate leads and ultimately sales for your business, particularly if your website design is built with the best practices for conversion in place. More than likely, this will not be a huge increase. But this effort only takes few minutes per image, in general. If that turns into just one more sale per month, the effort will likely end up paying for itself multiple times over. 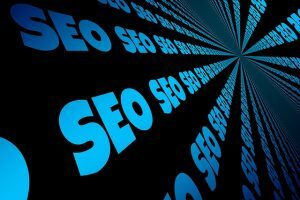 Our SEO team is well-versed in image optimization, as well as other on-page SEO techniques. And our website design team knows how to built sites meant to convert. When you’re ready to take your website to the next level, give Asterisk Creative a call! Posted in Search Engine Optimization, SEOTagged Search Engine Optimization, SEOLeave a Comment on Is Image Alt Data Really Important for SEO? SEO, or search engine optimization, helps your website get found by the search engines for appropriate search queries. And it’s not just for the overall site – it’s for each page of the site, too! This SEO primer gives you the elements where you’ll need to focus to get your optimization efforts started. Start with the Google Analytics and Google Search Console available for your site. Look at what pages are visited most often and what searchers are typing in to get there. If the queries are good matches, you’re off to a good start. If not, you have a bit more work to do, but it’s not impossible to fix. After that, use the Google Keyword Tool to take a peek at what other queries people are using to find your goods or services. Edit this list to fit your business, and you’ve got a great start on your SEO. This is the first place the search engines look to determine what the page is about. Your title tags should be keyword-rich and descriptive without going overboard into keyword stuffing. Each page should have a unique meta description. This is the information about the page that shows in the search engine results pages (SERPs). In addition to using your keywords for the search engines’ benefit, you’ll also need to make the content read well to the human eye. This ensures searchers want to click through to your site. There is a specific percentage of times the search engines look for your keywords within your overall copy on each page. Though the search engines won’t release what exactly that percentage is, most SEO practitioners and SEO plugins have an educated guess. 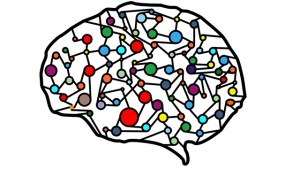 This is your keyword concentration. You risk not being indexed for terms you want to be found for when you fall below this percentage. If you go above this percentage, you risk being “punished” for keyword stuffing. This piece is often overlooked. While it’s not necessarily the most important piece of the SEO puzzle, it tells the search engines what they’re “seeing” in your images. When your image is indexed for a particular keyword, the page it’s associated with on your site is also indexed. This helps pages within your site be found for even more terms. At Asterisk Creative, our SEO team stays on top of SEO best practices and changes to the search engines’ algorithms, so we know how to implement these items in the manner that will best help your business. Seem like too much to take on for yourself? We get it! Contact us for SEO help today! For medium and small businesses, it may seem a daunting task to take on large corporations when it comes to SEO. But with the increase in local-based searches, the search engines’ algorithms have adjusted to provide the best results. Here’s how to take advantage of local SEO. Verify your Google My Business page. The verification process is pretty painless, and it gives you ultimate control of information being fed directly to Google. Anyone can submit edits to Google on business pages – including your competitors. When you verify your pages, the edits have to be approved by YOU before they publish to the internet. Conversely, edits to unverified pages just need to be approved by Google. If your page is unverified and someone marks your business as closed, if Google decides to publish that, your business will show as closed to anyone who searches for your business or your services. Is not verifying you page really worth that risk? Make sure your physical address is on your website, preferably in the header and/or footer. When searches include a neighborhood name, a zip code, or the phrase “near me”, the search engines do their best to find results that actually fit that parameter. As a result, having your physical address on your site provides indexable data to make your site match appropriately. Without that information on your site, you are probably missing out on showing to potential customers. Include your neighborhood name or locale in your title tags, meta descriptions, image alt data, and on-page copy. The principle behind this is the same as including your physical address on your site. Having this data included in indexable areas that show to searchers and site visitors similarly increases the likelihood that your site will show in the search results, will garner a click-through, and convert into a lead and/or customer. Does this sound like too much to take on all on your own? We get it. Trust your SEO to Asterisk Creative today. What Does Mobile Search Mean for Website Design? Back in the day (like, 7 years ago or so), websites showed on computers and phones were just…phones. With the advent of internet-enabled phones and then smartphones, all of that started to change. Websites didn’t render properly on these smaller devices, so changes had to be made. So what does the rise in mobile searches mean for website design? 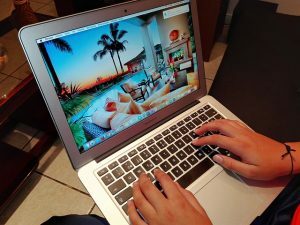 The initial reaction by website designers was to create, in essence, two sites – one that would load when a search came from a laptop or desktop computer, one that would load when the search came from a mobile device. This is still a recognized practice, though it’s fallen a bit out of favor. The search engines tend to see the sites as two separate sites, one with duplicate content of the other, and this tends to hurt your organic rankings. With mobiles searches increasingly on the rise, the search engines – and Google, in particular – are moving toward mobile-first indexing. This means they’re focusing more on how sites load on mobile devices than on computers. To keep up and maintain organic rankings, website designers and webmasters need to shift their focus as well. Moving to responsive web designs is a great place to start. Responsive website designs adjust automatically to fit the screen on which the searcher/visitor is viewing the site. This eliminates the problem of separate sites/duplicate content while creating a better user experience across the board. Mobile searches are also more likely to include the phrase “near me” in the queries. Website designers and SEO practitioners alike should ensure elements like a business’ address and/or neighborhood are clearly listed in multiple places on a website to match these queries appropriately. Website design for mobile searches is important. Make sure your website is mobile-friendly. Contact Asterisk Creative for website design help today. Posted in Search Engine Optimization, SEO, Web Design, Website DesignTagged Search Engine Optimization, SEO, Web Design, Website DesignLeave a Comment on What Does Mobile Search Mean for Website Design? Machine learning is defined on Wikipedia as “a subset of artificial intelligence in the field of computer science that often uses statistical techniques to give computers the ability to “learn” (i.e., progressively improve performance on a specific task) with data, without being explicitly programmed.” Simply put, it’s the technology that allows tasks like Google’s auto-complete function and “near me” searches to work. As machine learning grows, not optimizing around this technology stands to leave you and your business in the dust. Let us make machine learning work for you, too. Contact Asterisk Creative today to get started! With all of the security breaches and data breaches in the news lately, it should come as no surprise that Google is making moves to make the internet a safer place. In one such move, Google is going to require SSL certificates for all sites soon. First things first. What is an SSL certificate? SSL stands for secure sockets layer. The certificate being on the site creates an encrypted link between the server and the browser so that all data remains private. In effect, this technology protects site visitors from cybercriminals. After Google implements this SSL requirement, sites without an SSL certificate will be flagged as “not secure”, alerting searchers that visiting that site may put their data at risk. Obviously, this will be a deterrent for potential site visitors, and your website’s traffic will invariably suffer. In addition, sites without SSL certificates will be “dinged” in the organic search results, no matter what other SEO (search engine optimization) work has been done on the site. This move had been slated to take effect in July, but Google has pushed the deadline back to September for now. This may change again – to be pushed back to later than September or moved up to sooner. Get your site set now. Contact Asterisk Creative for your next steps today! There are a lot of components to digital marketing. In general, it is comprised of website design and development, SEO, social media marketing, and pay-per-click advertising. Basically, it’s any marketing and advertising that appears online. Many freelancers and solopreneurs fancy themselves digital marketers, jacks-of-all-trades so to speak. We’re here to tell you that that’s nearly impossible. 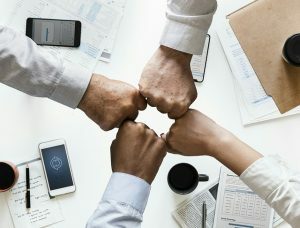 Keeping up with algorithm changes, privacy laws, best practices, and such across one or two digital marketing platforms can be a full-time job in and of itself. One person may be able to do well across the board, but they cannot really excel. At Asterisk Creative, we understand this and have a team behind your digital marketing. We have folks that focus solely on social media, solely on website design, solely on SEO – and each knows their specialty inside and out. They work and train to stay on top of the latest and greatest in their field, and they put that knowledge to work for our clients. Additionally, they work together to make sure all of the client’s digital marketing elements are working together favorably and promoting the brand appropriately. Don’t trust your digital marketing to just anyone. To get your digital marketing going full speed, contact Asterisk Creative today. As noted on our homepage, Asterisk Creative offers search engine optimization, or SEO. But what is SEO? When you do an internet search, you probably notice there are some results marked as ads and some aren’t. The ones that aren’t marked as ads are considered organic results. This means the search engine determined the information on that page as a good match for your search term. It’s important to note here that there are multiple search engines. Google, Yahoo and Bing are the big three, but there are other, smaller engines like DuckDuckGo, Yandex, and Boardreader that still exist. SEO is the work done in the backend of your website and social profiles that tells the search engines to “see” that page for terms for which you want it to be found. On your website, this involves editing multiple elements of your site based on the criteria the search engines look for when “choosing” websites for their organic results. These elements include page title tags, on-page content, image alt data, and page meta descriptions, among others. It’s not enough just to throw your keywords in these areas willy nilly. Depending on how you work your keywords into these areas, the search engines could see your efforts as keyword stuffing. Per Google, the definition of keyword stuffing is “the practice of loading a webpage with keywords or numbers in an attempt to manipulate a site’s ranking in Google search results.” The search engines don’t like keyword stuffing. This could potentially not show your site at all if that’s what they determine that you’re doing. Best practices exist around how your title tags should be laid out, how often your keywords/search terms should appear in your content, how many characters your title tags and meta descriptions should have, etc. Each search engine has different rules for these elements. A good SEO practitioner knows how to choose which search engine is your priority based on the audience you’re trying to reach. In addition, they understand how to work with those rules to get you ranked on more than one search engine. The search engines also consider your linking strategy when they’re deciding whether or not to show your site in their organic results. They look for internal links (links that go to another page within your site) and external links (links that go to another site). They also place a value on your link’s anchor text (words within your copy vs “click here”). In addition to SEO work needed on the pages of your website, off-page work is needed as well. A full-scale SEO strategy involves work such as guest posting on other websites or blogs, a plan for producing inbound links, disavowing poor quality inbound links, online directory listings with keyword-rich descriptions, and more. Adding this layer to your SEO strategy expands your potential for being included in the organic results. Ready to take your website to the next level? Contact Asterisk Creative for SEO help today. 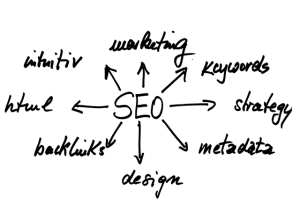 Posted in Search Engine Optimization, SEOTagged Search Engine Optimization, SEOLeave a Comment on What is SEO? As a full-service marketing and branding agency, we at Asterisk Creative understand growing a brand is about finding the authentic values that consumers share and leveraging those in a way that creates growth. We start with an open, collaborative discussion about your marketing and branding goals and how they pertain to your overall business goals, what is meaningful branding-wise, and a clear definition of what success will look like, then we get to work creating a branding and marketing strategy that is the right mixture of design, advertising, & public relations. We have a team of storytellers, listeners with the capability to create content, design, and experiences your audience will not only embrace, but will share.